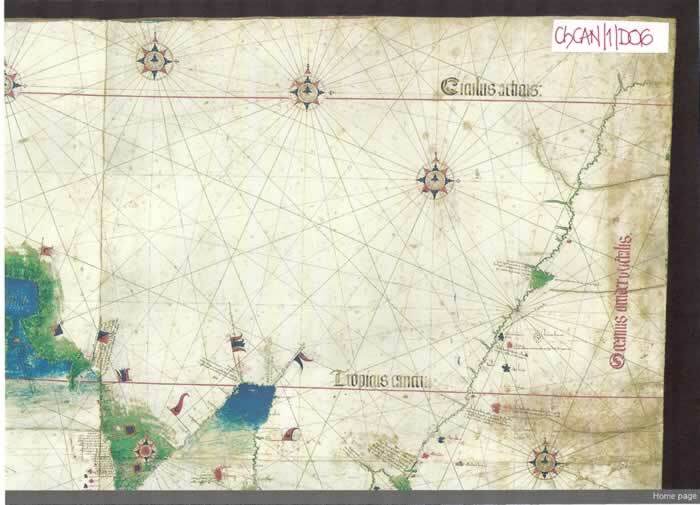 THE CANTINO PLANISPHERE; 1502AD PORTUGUESE EXPERTISE, IS IT COPIED? + CAVERIO; 1505AD PLANISPHERE IS NOT A COPY. 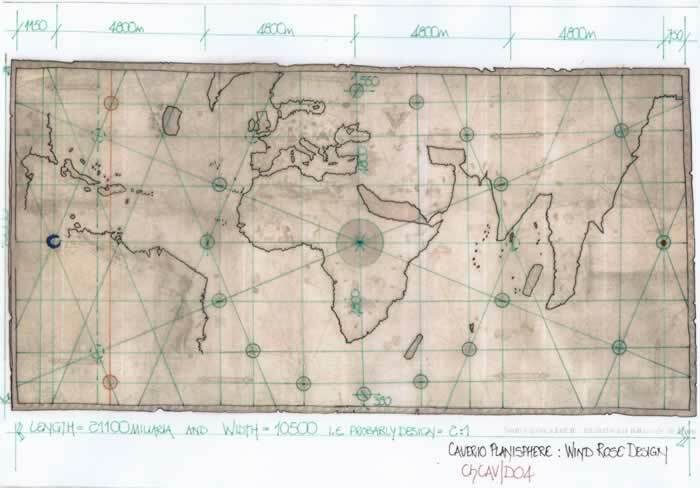 Having analysed the 1500AD La Cosa chart, the first to indicate the West Indies and South America, the next logical chart sequentially is the Cantino Planisphere, 1502AD. The historical context has been written a myriad of times, how Alberto Cantino on behalf of the Duke of Ferrara managed to purchase a copy of what was considered by the King of Portugal a secret chart, or a chart with secrets which should not be shared. But like most secrets they generally escape quite quickly when money intervenes! 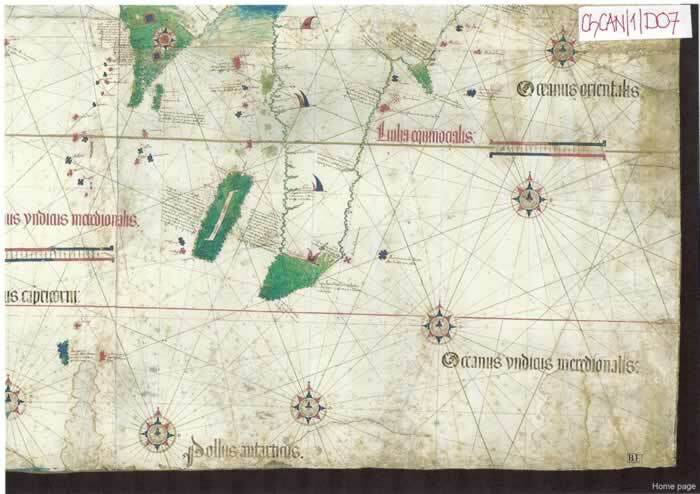 As I consider the eastern section of the 1500AD chart to be of Portuguese origin, it is fitting that this chart is Portuguese continuing an obvious desire to map the world. Thus the inner workings of this supposed “copy” can be explored and exposed to the historians who I perceive have no idea of the hidden wealth of mathematics and geometry there-in. Although I am illustrating the whole planisphere as one diagram its size, some 1050 x 2180mm (2200) requires a fuller presentation as follows. I commence with the Northwest section which indicates the North Atlantic and the Caribbean Sea from West Africa to Cuba. It clearly indicates the Line of Demarcation and the fact that the lands to the east are Portuguese and those to its west are Spanish lands. 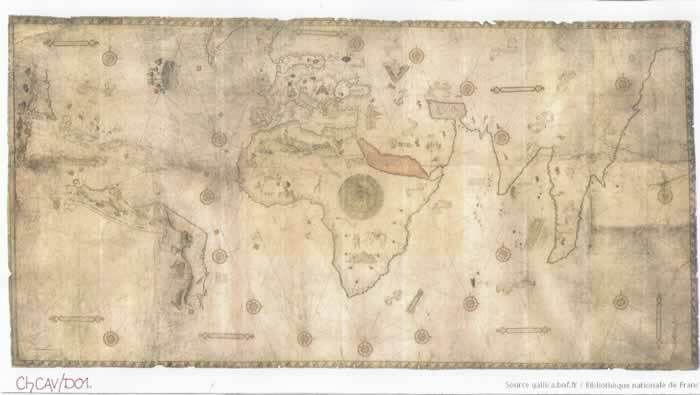 The Southwest section covers the continent of South America as “discovered “by 1500AD and fittingly for a Portuguese Chart it has their possessions richly decorated. The centre North section is basically Europe and the north of West Africa, but it includes a semi Ptolemaic Sinus Persicus. Again the interior of Africa is richly decorated as Portuguese territory and Cities are boldly drawn. Curiously though, the Alexandrian Lighthouse has been drawn horizontally, but with the flag finial aligning to the City of Alexandria toponym. The portrayal of Venice is excellent, as is Jerusalem. 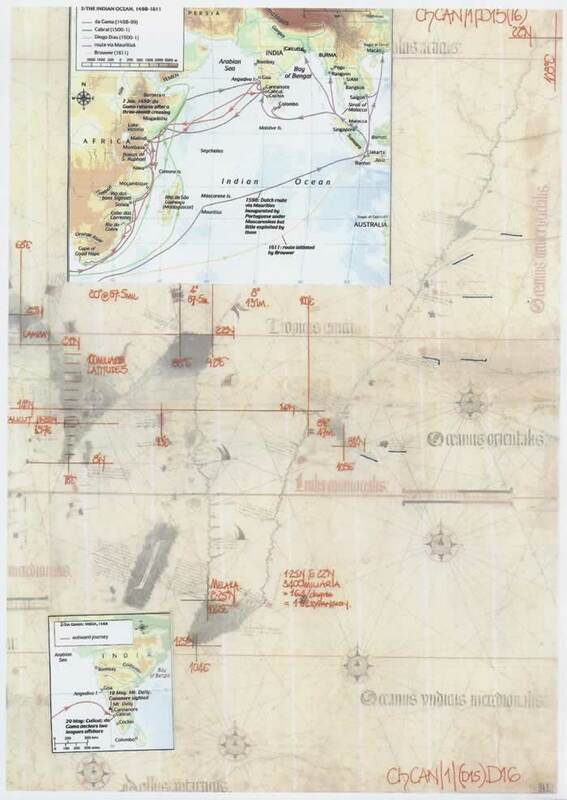 The centre section South, Africa south of Cape Verde is a complete record of Portuguese exploration with four main “Padroes” shown in position. The Red Sea is however rather strangely drawn for a chart of this era. The vignettes are again excellent. The Northeast section of the Planisphere is mostly devoid of decoration and merely indicates the triangle of India and the start of an extraordinary coastline from the Mekong Delta to the Gulf of Tongking, being the coastline of Vietnam with some islands. 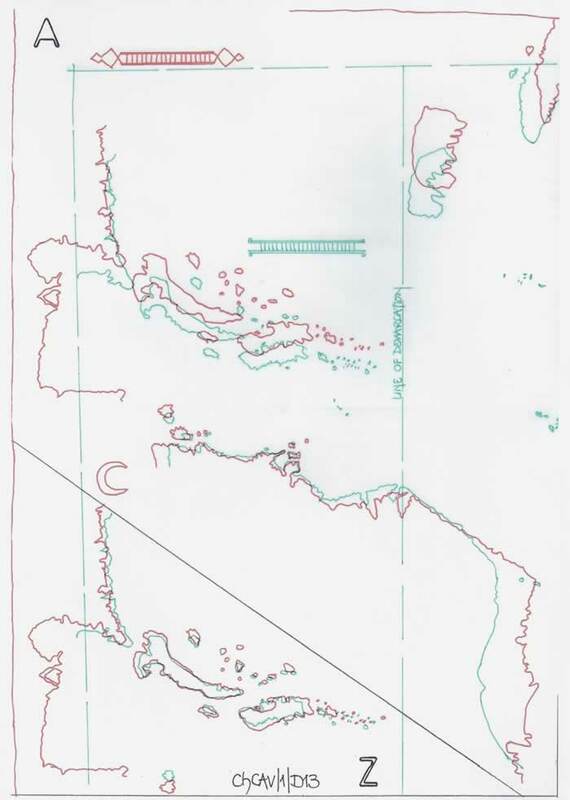 The Southeast section indicates the residue of the Malay Peninsula but at such a scale as to indicate Singapore being just north of the Tropic of Capricorn instead of just north of the Equator and hence the Malay Peninsula is some 23 ½ degrees latitude over long. Taprobane (Sumatra) is wildly out of position, but of course this was unknown to Vasco da Gama to whom we are indebted for the original information as is discussed later. The Portuguese were anxious to capitalize on the “Riches” which may be available in the eastern portion of the World as determined by the Treaty of Tordesillas, and to that end they had been exploring firstly the West Coast of Africa, then the East Coast and finally Vasco da Gama with the help of a Malindi Pilot sailed across the Indian Ocean to Calicut, India. That last exploration from 8/7/1497 to September 1499 enabled Vasco da Gama to gain some knowledge of the Malay Peninsula and the Eastern Ocean from the Arab Seamen he utilized to make his voyage. That data arrived in Lisbon during September 1499 and enabled a Portuguese Cartographer to construct a “Mappa mundi” stretching from the Caribbean Sea to the East coast of Vietnam and north to the Gulf of Tongking, which is a longitude of 204 degrees geographical. The Portuguese had already obtained the basic information regarding the West Indies and South America and established rights there. 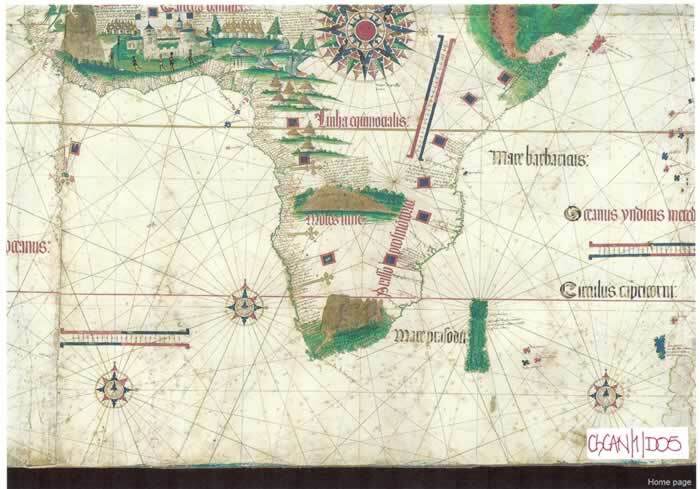 Africa by 1497 was a well known continent as it had been sailed around for years and the latitudes were well plotted. However the Persian Gulf was unexplored by Europeans and hence portrayed as the Ptolemaic concept. 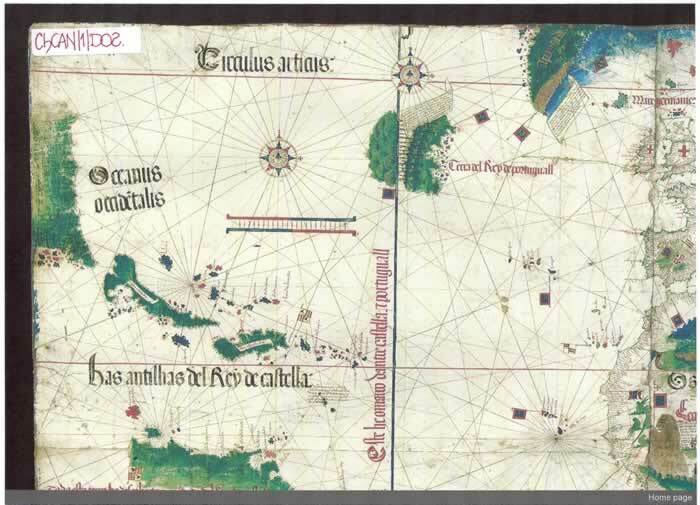 Vasco da Gama must have gleaned extraordinarily good data from the Arab sailors to enable India to be portrayed as shown, although Niccolo de Conti, an Italian from Chioggia travelled these seas from the Ganges to the Malay Peninsula and Sumatra/Java with Fra Mauro using the information on his spectacular World map of c1450AD. Thus Portuguese Cartographers had various sources to enable the “Mappa mundi” to be drawn; however distance measures were as ever a major problem with the units of measurement being continuously confused and misunderstood. But the chart also exhibits through its draughtsmanship the basic problem of differing degree measurement with the Equator accurately being a 90/90 Miliaria graticule; the Mediterranean Sea a 90/72 Miliaria graticule and thus the southern tip of South Africa should mimic the Mediterranean Sea measurements as it is at 35S. Thus the traditional rectangular graticule was problematic. 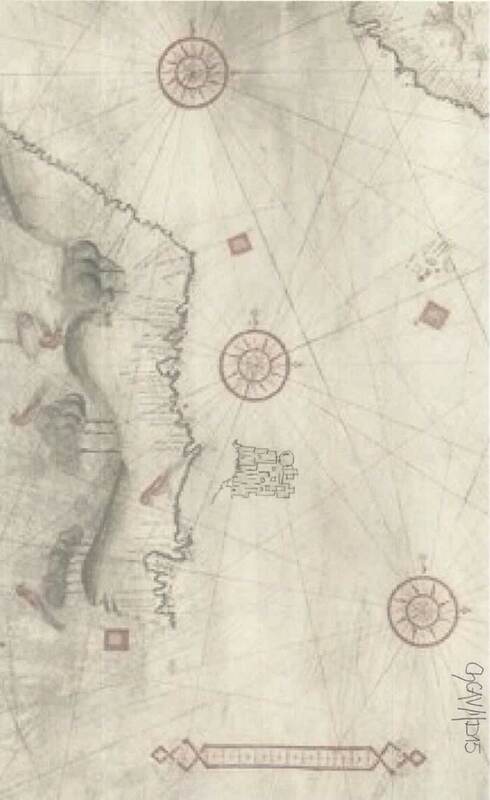 It is obvious that an error was made whilst the “copy” was being drawn, to the South American coastline and this is discussed later in the text. The primary dates are the return of Vasco da Gama to Lisbon (we are given three close alternatives; 29/8 or 8/9 or 18/9/1499) and the letter by Alberto Cantino to the Duke of Ferrara, written in Rome, 19/11/1502AD. Commencing in Rome, the journey from Genoa and composing the letter would be perhaps one week and thus A.C. left Genoa c12/11/1502AD. 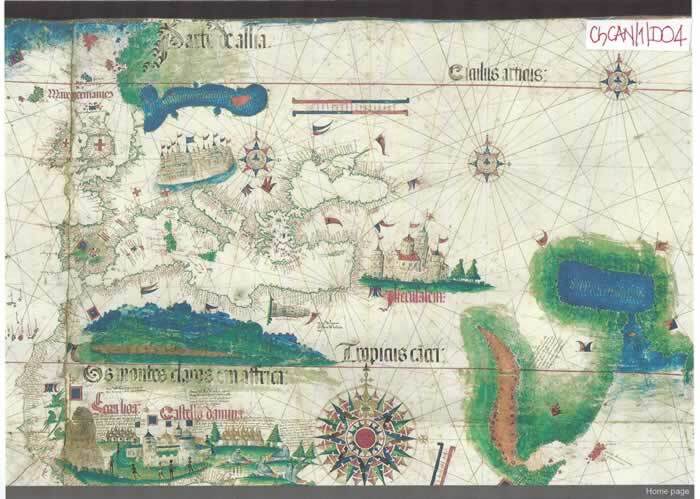 If he was in Genoa for a week after his long journey to ensure the Chart was safely delivered to the patrician Francesco Cattaneo who had it sent on via the Duke’s Agent, he probably arrived from Lisbon 5/11/1502AD. At this time of year the weather in the Mediterranean Sea could be benign or dangerous and as the journey required travelling across Portugal and Spain to a port of embarkation for Genoa and then the sea crossing, this would be approximately a month of travelling. Thus in all probability Alberto Cantino left Lisbon at the beginning of October 1502AD. We are informed that the chart cost 12 Gold Ducats for the “copyist” and required some 10 months to produce; that is from December 1501 to the beginning of October 1502. Thus the original chart had to have been finished well in advance of that date, which is prior to December 1501 and probably well before that date to allow the King of Portugal and his advisors to study it, and for word of its existence to percolate to ambassadors etc. If the “copy” took as long as the original to produce or longer as it was not a copying exercise we can at least use the same timescale to discuss the original dates. 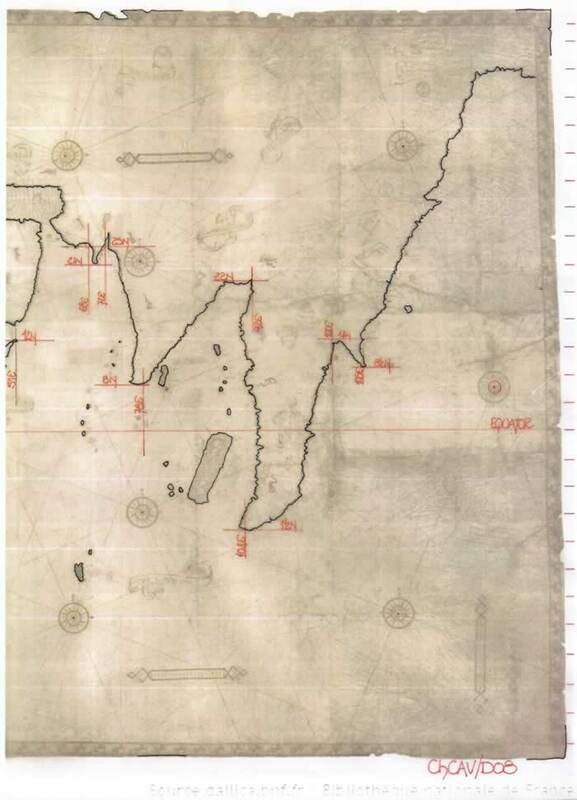 Vasco da Gama would in all probability not have been ready to discuss the chart details until at least late October 1499 and thus if the timescale is to be assessed correctly, if it was finished in October 1501, that would give the cartographer two months to aggregate the data and plan the charts construction prior to commencing its draughting. However, if some pre-planning was possible, that is the West Indies and Europe/Africa to the Persian gulf, where that area to the Indus River is very similar to the 1500 La Cosa chart, a plan of action could have been formulated in advance, but only when the eastern section was known could the basic wind rose setting out and symmetrical layout be established as the overall size of the chart could then be determined. 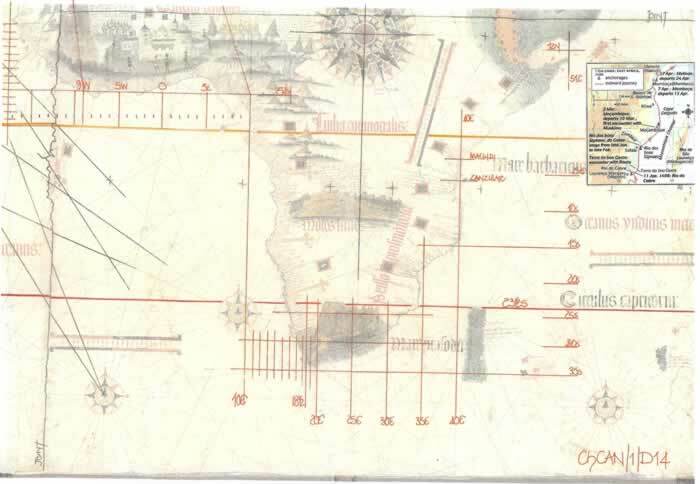 My personal thoughts on the chart and its “copy”, with no actual proof, just a “belief” determined by the presentation, is that the original chart was drawn on six parchment sheets and these were in fact copied immediately by the original Portuguese cartographers. I do not think that just one chart would have been drawn as that would leave the cartographers with no template or record when the original was handed to the King of Portugal and his advisers. 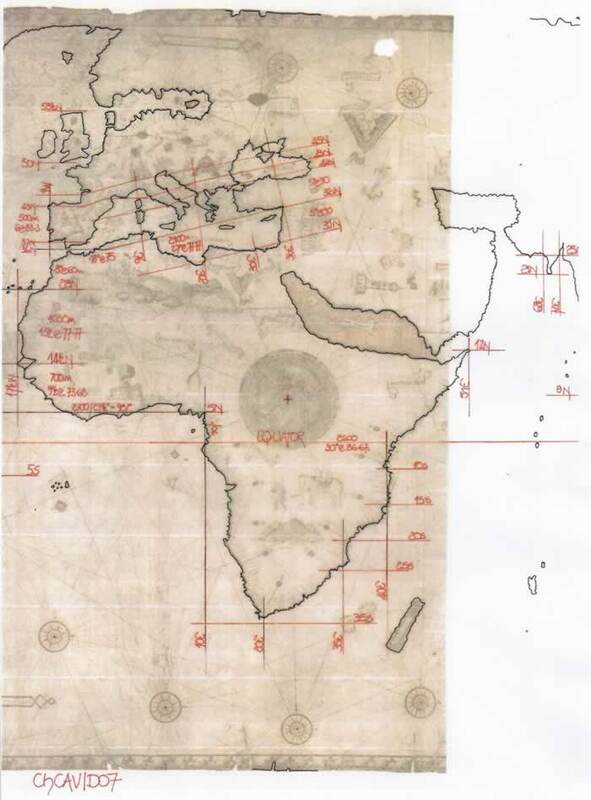 Thus the Cantino Planisphere is in all probability a copy of one of several base charts prepared from the Vasco da Gama data and as such could have been quite easily copied, even surreptitiously without the knowledge of the King or his chart ever being used, and that of course would be unnecessary if there were other copies available. It also makes sense that being in six sections, if it actually happened as the storyline tells then each could be copied individually without the requirement to “borrow” the whole chart. I do not believe the whole chart could be made available for 10 months, and thus if it was one of several copies, it need not have been. However, the detailed description which follows raises some intriguing points apropos the authenticity of it being a complete new copy of the originals and not actually a “cobbled together” amalgam of charts which were the original atelier copies. The chart is made up of six sections of parchment which have been joined to form an overall chart which is now some 1050 x 2180mm (2200). The present bordure outline is a gold line which has been obviously cut through in places and in some instances is no longer visible. Thus it is certain that the original chart was larger on all four sides. The eastern and western borders are perhaps the closest to being the full line but both borders show signs of other colours or smudges which could indicate there was a coloured edging band as with many other charts. Some researchers have interpreted the western smudges as possibly an extension of the coastline from the north, but with the gold line above and below, it is hard to accept it would have been cut through by the diagram chart. In fact when the whole chart is assessed this is clearly shown as a misnomer. The southern border does not appear to be so affected, but traces of colour could again indicate the fact that the gold line was just part of an elaborate bordure feature. Hence the western edge colours are visible but not identifiable. The northern border is however less certain with the obvious “tail” of a letter showing adjacent to the Line of Demarcation, and the wording “Parti de Allia” in fact crossing the gold border line. Thus it is fairly obvious there was an extension of the chart to the north, no doubt containing information on the chart, perhaps its title and date, and the gold line is later. 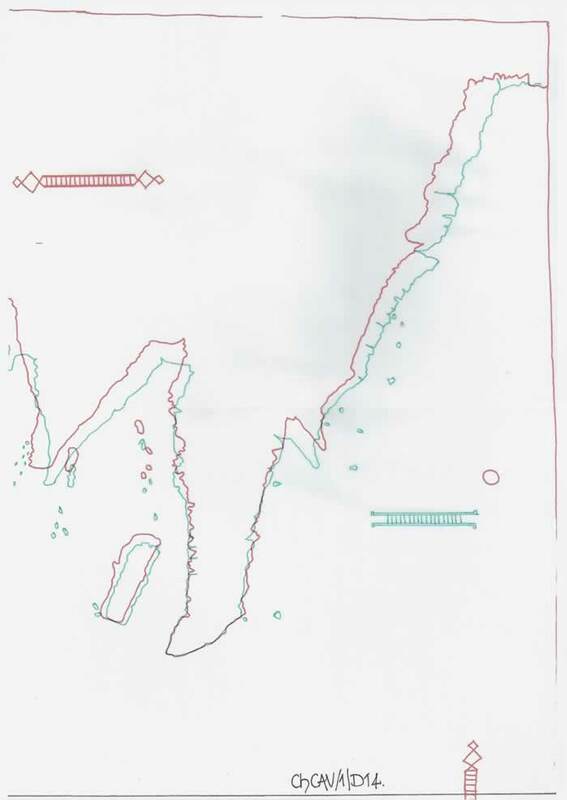 These extensions, of unknown width, could well have been a border for the whole chart which was removed, cut back, because of substantial damage caused by the fixations for the chart onto substrates during its long life prior to the discovery. The six sections of parchment are joined together, but they are of three differing lengths. The central sections are the largest in length with the western sections slightly smaller with the eastern sections smaller still. If the central sections are used as a guide then the western section could be the same size with an extension to the west, it having been removed. The eastern section is approximately 5/6ths of the central section and thus could not have been sized to suit any others but just to provide the overall measurement for the Windrose construct. However a careful study of the six sections will show that the central and eastern sections are very accurately joined and thus the lines are continuous across the joints and are a testament to the accuracy that could be achieved. Now, if we study the western pair of parchment sheets a very different picture arises. The vertical joint is far from being accurate and its format of a much fractured edge line indicates a large problem with the alignment to the central parchment pair. The fracturing actually gives the impression of the parchment being hurriedly torn in order to provide a junction to the central sections and thus a full chart. In fact to align these four sheets properly the western pair would require twisting in such a way as to negate not only the horizontal joint line, but be nearly impossible to make a proper join in any instance. A close study of these two sections will show that the Equatorial line and the Tropic of Cancer line are out of alignment and the wind rose lines do not join and are very far from accurate. The opposite to the eastern joint lines! The Arctic line actually bends to suit the section format! The lettering for the four horizontal lines, although similar, in fact has differences in style and spelling such that it is quite possible these two sections are drawn by a different hand, and are thus perhaps an indication of several persons involved and copies being made. The obvious alteration to the coast of South America is dealt with later in the text. One final thought is that in fact the original western pair of parchment sheets have probably been replaced, but as the wind rose design and all else is constant they could just be replaced by exact atelier copies. However this raises the spectre that the “copy” we are told took 10 months to produce at a cost of 12 gold ducats may not be a total copy. The two western sections just do not fit properly and having cut a print of the chart (large scale) I found it impossible to obtain a correct fit which is clearly possible when they are correctly drawn as the other sections indicate. Thus I conclude that the western pair are not actually the same chart copy as the central and eastern pairs but probably one of the (I believe) several copies which the Atelier would have made to enable new charts to be produced as further exploration opened up the Far Eastern lands. But surely, an atelier would hold a copy or template for future charts? What I consider happened is that the central and eastern sections of the chart are contiguous, prepared for one chart and it was perhaps impossible to copy the western pair in the timescale allotted for any of a dozen reasons and one pair of a “spare” section drawn by the Atelier were cobbled together to approximately fit the near perfect sections. Hence the fudged join with pieces torn-off to allow toponyms to be read and the wind rose lines to be nearly aligned. and that is an observable fact which requires answering. On his atlas pages of the early 1300’s Petrus Vesconte detailed precisely the methodology to be used to set out a wind rose diagram without the aid of a pair of compasses but by geometrical means as my texts ChWR/1 and ChWR/2 clearly demonstrate. Contrary to other researchers who have drawn circles on this copy chart, which are actually non-existent on either of the wind rose forms, and failed to investigate the actual drawing/ measurements used, they have thus seriously mislead others. The whole Planisphere can be shown to be a meticulously planned, a geometrically and mathematically perfect setting out of not only the wind roses but therefore the basic design of the planisphere. The first point of conflict I have with other researchers is to my mind the simplest to prove and thus should never have required to be questioned. The scale bars are six in number, all exhibiting the same distance measures and thus spacing, although slightly different in length, but all having the five dots between alternate lines to indicate the basic division of 50 units. Thus they are, as is easily proven by the chart, Miliaria of 1.233Km and not leagues of 17 ½ per degree but 50 miliaria divisions and thus 90 miliaria per degree of latitude. The age old problem of the latitudes being drawn at 75 miliaria mistakenly for 75 Roman Miles is dealt with later in the text. However the spectre of the league length will be addressed! Having established the scale bars intent we can measure the wind rose graticule and ascertain the master setting out. Petrus Vesconte used a wind rose having 92 trignometrical units for the basic radius, hidden or not, and then used his scale bar to distance those 92 units. Study the Planisphere, measure the graticule using the scale bars and very simply the setting out of the wind roses are 92 units each 90 miliaria. That is a total of 8280 miliaria and thus a putative radius (if one must think that way) of 92 x 45 miliaria which is then sub-divided into the standard sections of 35/30/20/7 TRU’s and those are 1575/1350/900/315 miliaria. Thus the overall graticule is 16560 x 8280 miliaria. Measure the chart total height north/south and from the wind rose to the Gold bordure it is 450 Miliaria and thus the charts overall height is 9180 miliaria. Measure the east/west extra areas and they are 1215 miliaria which produces an overall length of 18990 miliaria. But it should also be noted that the 1215 miliaria is in fact the addition of the 20 and 7 TRU sections being 900 and 315 miliaria, totalling 1215. Thus simply put, the chart has been set out on a symmetrical double wind rose and on a symmetrical parchment made from three differing size pairs of parchment. However the bordure has been drawn out of square with the Tropics, Equator and Arctic lines which are parallel and spaced correctly. This indicates a hurried set of bordure lines being drawn incorrectly and could indicate that the “copy” chart was finished in a hurry, cobbling together the western sections and then adding the surround to the chart, totally out of alignment in the hurry to finish. Thus the titles noted are cut by the bordure which is not normal on a chart. The latitudinal measure is set from the Tropics/Equator distance and is 75 miliaria per degree. This of course should be 90 miliaria which is the equivalent of 75 Roman Miles per degree and the usual mis-interpretation by cartographers of the Medieval age. Thus we can calculate that the height of 450 + (92×90) + 450 miliaria = 9180 miliaria and is thus 122.4 degrees. It is set out as approximately 72 degrees north and 50 degrees south of the Equator. Thus geometrically and metrically the Portuguese cartographer has produced a tour de force on which to set out the planisphere with the ability to use the wind rose graticule for measurement purposes. However it is quite obvious that the basic setting out of 8280 miliaria must be capable of translation into an actual measurement of Portuguese origin such as a “Foot” or “Inch”. 1 piede de Lisboa = 1 ½ palmo de craveira = 12 pulgadas ou pouces = 18 doigts or dedos = 72 gran ou granus = 144 linhas, and is approximately 330mm but it varies slightly in the regions. That is quite normal even after standardisation is imposed. The chart is at present 1050 x 2180mm (2200) and thus that is 9180 miliaria. Therefore 8280 miliaria, the square of the wind rose is c920mm. The pulgada (inch) is in the region of 27.5mm and 920mm will therefore equal 33.4545 pulgadas. But 33pulgadas would in fact only be 27.88mm each and give a “foot” of 334.5mm. As usual when we play with numbers there is always an alternative and that is when the c920mm is divided into “Fingers” or “Dedos” and thus 50 dedos x 18.4mm = 920mm and a foot would be 331.2mm. Obviously either calculation would be quite acceptable and the “foot” at either 334.5mm or 331.2mm and the c920mm will be easily drawn by the cartographer to be sub-divided into 92 x 2 parts using 33 pulgadas or 50 dedos. How long is a piece of string, take your pick, but the answer will probably be similar to the above calculation. 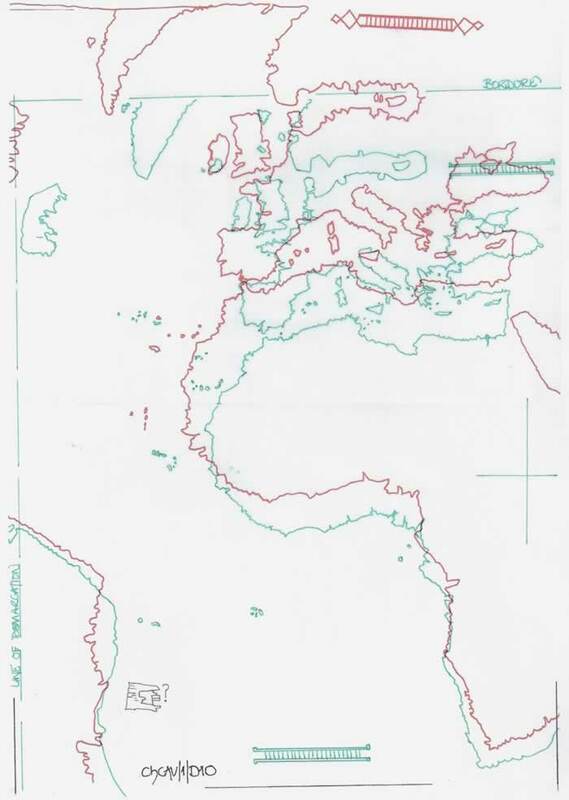 A basic analysis indicates that the west coasts of Europe and Africa are drawn similar to many Portolan Charts and have a basic 75 Miliaria latitudinal scale. The overall presentation is accurate or as accurate as most other charts which indicate this area. The West Indies however have been drawn to a very different scale which is consistent for longitude and for some adjacent latitudinal measures, but Cuba itself is unfortunately burdened by a northwest protuberance which is seen also on other charts and the original sketch maps of these islands. The Line of Demarcation when measured by the scale bar from the centre of the Cape Verde Islands at 25W indicates a League of c4.46 Miliaria which is c5.5KM and thus c3.72 Roman miles. However it is also c2.97 Millas Geometricus/Geographicus and in all probability was meant to be 3 Millas Geometricus/Geographicus per League and hence a distance of 1665 Miliaria as opposed to the scaled 1650 Miliaria, a difference which was probably not detected originally when drawing the Planisphere. That of course indicates a League of 4 ½ miliaria but it is also 3 Millas Geometricus/Geographicus, a norm for the age. The first major change from the above section is that the 60W longitude has been moved westwards by c850 miliaria and then the 70W and 75W longitudes are set out as the first section at 112 miliaria per degree. This 60W is then 2800 miliaria from the 25W longitude and thus each degree is 80 miliaria, and near enough to the Cosine calculated length to be acceptable. The latitudes for the eastern coast of South America are a constant 75 miliaria and accord with the latitudes for West Africa to the 10N latitude. The actual geographical coastline for South America has been appended on the plot to indicate the correctness of the latitudes and the close reading of the longitudes, but of course there was a large error on the original plot which has been overcome by a patch adhered over the original. This has left the toponym of Cabo San Jorge written twice on the chart. I would also caution careful examination of this section of the chart as it appears it is possible there is an even greater patch indicated by the fracture in the Line of Demarcation as it crosses the Equator, as well as this Equatorial Line being fractured at the section joint. 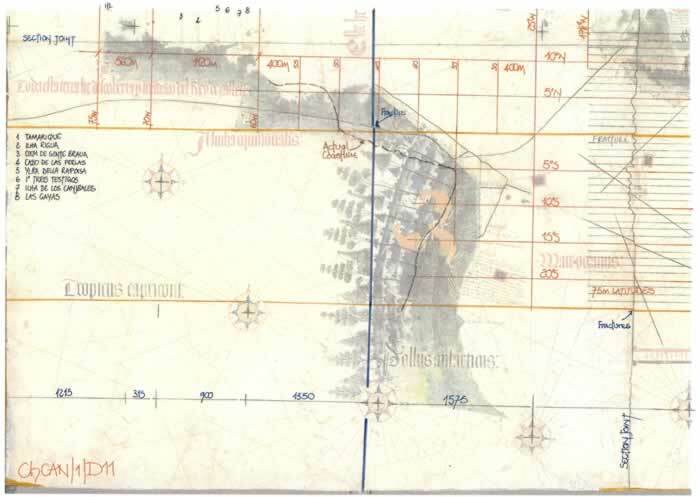 This section is basically Europe and North Africa and has appended the major graticular lines which indicate the form of the chart and the putative grid. 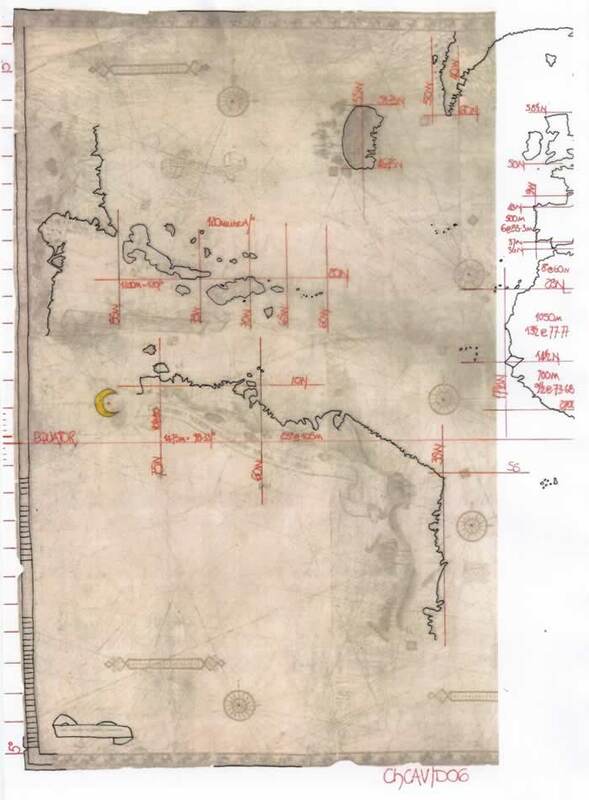 It is consistent with a myriad of other Portolan Charts covering the same geographical area and therefore has no surprises but has been investigated in a detailed manner in the following section. The latitudes at the western extremity of Europe are basically 75 miliaria with minor variations to the north of Iberia. But longitudinally there is a rather large discrepancy between 9W and 9E longitude, they being either 66.67 or 64 miliaria. The correct longitudinal measure is to be found from the 9E to 36E lines, and is 72 miliaria per degree. The normal distortions occur in the latitudes as can readily be seen, but overall it is an acceptable rendition of the Mediterranean Sea basin. Africa is a tale of several parts commencing with excellent longitudes at the Equator of 90 miliaria each. But from the 10E longitude to the 20E longitude they reduce to 75 miliaria and from the 20E to 40E longitudes which locates the East Coast rather well with both Malindi and Zanzibar correctly positioned latitudinally they are 70 miliaria each. However below the Tropic of Capricorn, 23 ½ degrees south, Africa is reduced latitudinally to c61 miliaria per degree, where-as from the Equator to the Tropic it is the standard (although wrong) 75 miliaria per degree of latitude. I consider the 61 miliaria in fact to be a mistake for 60 millas geometricus/geographicus as explained later. 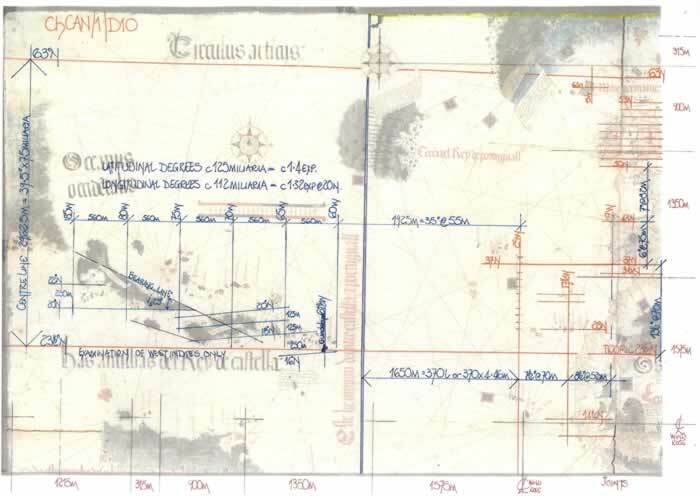 The mis-alignment of this sheet to the south western sheet is only too apparent at the joint line of the parchments and thus they are not the same original chart plot. 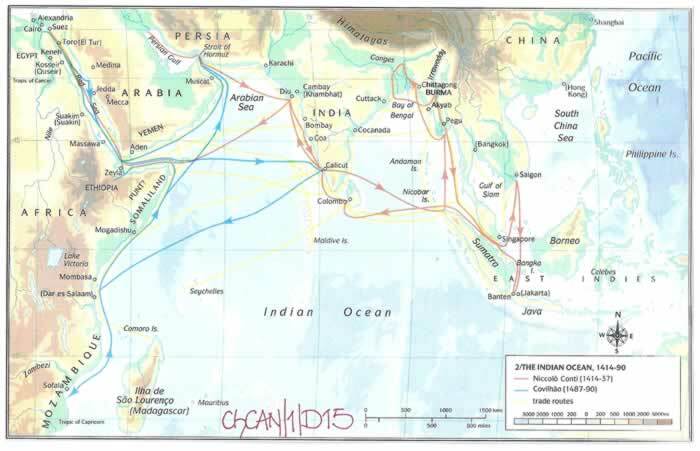 I have included the Indian Ocean exploration chart, 1414-1490 to indicate what preceded the Vasco da Gama voyage of 1498. We know Niccolo Conti, an Italian, sailed these parts, but we do not know of any longitude/latitudinal assessments. The combined eastern sections commence with the Indus River, 68E, and the Gulf of Cambay which is correctly positioned and finishes at 108E, the Gulf of Tongking. Vasco da Gama sailed as far as the west coast of India, Calicut, which is 11.25N/75.7E. The Indian sub-continent has been drawn as a simple triangle, but although its longitude at c22N is correctly scaled, the southern tip, 8N/78E has been drawn 300 miliaria west of its geographical position. The shape of India was explained by Strabo from the writings of Eratosthenes’ and as my text ES/1 and ES/2 indicate it could have been drawn more accurately as the text of Strabo was by then well known. The northern Andaman Island is correct latitudinally as is the head of the Gulf of Siam, but all else on the Malay Peninsula and the east coast of Vietnam is an interpretation of the Arab description given by the Malindi pilot and others, probably day’s sailing distances. It is necessary to comment on the textual notes appended to the east coast of Vietnam and the Islands there as they indicate the major problems faced by the Portuguese when they first arrived to establish their positions on the global scene. The notes refer to, “norte em iij pulgadas” and further north, “norte em xv pulgadas”. This is an Arab methodology derived from their instrument called by Europeans a “Kamal”, which measures latitudinal positioning by “fingers”, Arab “isba”, which the Portuguese translated as inches, “pulgadas”. The Kamal is used by reading off the angle of the Pole Star and a brief description is appended to this text. It is actually nigh impossible to determine their actual readings as the division of the “Kamal” string can vary from 1 ½ to 2 degrees and has even been quoted as 10 42’ 50”, which I find extra ordinary. A Finger width is a variable feast as will be discussed. There are many texts which discuss the toponyms for the Malay Peninsula and the translation of the Arabic pronunciation to Portuguese and therefore will not be discussed. When the Portuguese explorer Vasco da Gama utilized an Arab Pilot to guide him from Malindi across the Indian Ocean to Calicut, a chain of events were set in motion. Firstly the Portuguese were adept at latitudinal measurements via the Suns’ altitude and declination tables. They considered the world as divided into latitude and longitude measured by the degrees of a circle. 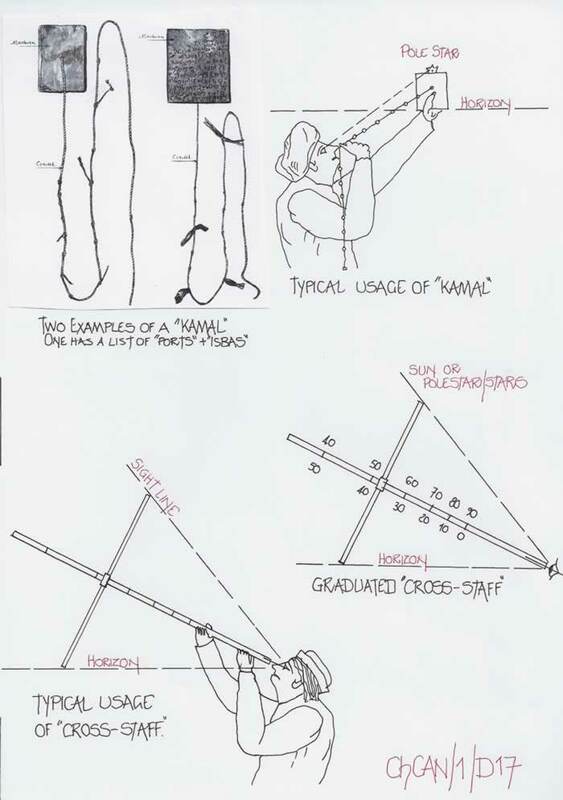 The Arab sailors however sailed by using the Pole Star as the basis for measurement and did not utilize actual degrees, but “Isbas” or finger widths to determine their latitudinal difference by the height of the Pole Star at various ports. It was generally based upon their home port reading or “height” and all other ports were referred to it. The instrument called by the Europeans the “Kamal” was generally “home-made” and based upon a simple construction of a rectangle of wood or shell and a string set from the centre of the wood/shell and knotted along its length with the readings taken there-by. The diagram has two simple examples and is shown in use by the simplest of manners. Basically, hold the timber in the left hand with the arm extended fully and then gradually reduce the arm length until the bottom of the timber sits on the horizon of the ocean and the top marks the position of the Pole Star when the number of knots can be counted off and the ships position known, north or south of the intended port. If this is for the Home Port a knot will be tied as the master knot and identified as such and used as the master guide. Hence actual latitudes by degrees are not known, nor do they require to be known as the relative position north or south of the Home Port is guaranteed by the position of the knots. The string can initially have knots tied at “finger” width or “multiple widths” which provided a clue to the progress of the ship from one known knot to the next. The problems with this method and construction are that no two “Kamal” need be the same; fingers do vary in width by hard manual labour swelling them and fine bony hands of more sedentary occupations or just poor diet, and hence the knot spacing can vary considerably. Various experiments have been carried out using finger widths instead of a plaque and the Arab pilots called four fingers a “dhubban”, but it obviously depends upon where you take the four finger width from, root or tip or centre finger knuckle, but they all give a different reading, and normally the fingers actually slope along the extremities. Thus on the Cantino Planisphere although we can read the texts adjacent to the east coast of Vietnam, “norte em iij pulgadas”, translating that into degrees is probably unwise as it has been shown that “kamal” readings vary from 1 ½ to 2 degrees per unit. However it does appear that the Portuguese adapted the “Kamal” to read as actual latitudinal units with the knot spacing adjusted to suit. Then Joao de Lisboa wrote a treatise, “Livro de Marinharia” in the early 16th century describing the “Cross-Staff” or “Jacobs-Staff”, as an angle measuring device to be used either horizontally or vertically. There is no doubt that the “Kamal” was probably the instigator of the Portuguese development of the “Cross-Staff”, but of course it was generally for solar readings and not Pole Star observations. In fact Joao de Lisboa wrote regarding solar readings made with a “Cross-Staff” from “Above” so that the Sun Disc was covered by the transverse and he noted that ¼ degree should be deducted, that being half the recognised diameter of the Sun. This usage is of course the reason so many pilots using the “Cross-Staff” were nearly blind or blind in one eye from the sunburn to the retina. It has been noted as used by Joao Gomes around 1524AD but there is some evidence of prior usage. The original chart is a mathematical and geometrical tour de force and obviously drawn by an adept cartographer who has produced a most beautiful chart for the King of Portugal. The marrying of the miliaria measurement and the Windrose graticule is hardly seen after the 1300’s as many Portolan Charts were drawn using a circle to form the graticule. The central section, Europe and Africa is one of the best examples of its cartography and to the west the South American coast has been drawn as accurately as possible. The West Indies is a copy of early Spanish data. The eastern section paved the way for an accurate rendition soon after when the Portuguese sailed further east and provided good readings of latitude and distance for longitude to enable a more geographic presentation. It is a tribute to Portuguese cartography which is sadly lacking in the historical record no doubt due to the earthquake and destruction of Lisbon and the records kept there. Had that not occurred I think we would be seeing a multitude of accurate and beautiful charts. The position of the Line of Demarcation amply illustrates that the League used is made up of 4.5 miliaria or 3 millas geometricus/geographicus. Thus 20 leagues equal either 90 miliaria or 60 millas geometricus/geographicus, and of course 75 Roman Miles therefore. Study the southern part of Africa below the tropic of Capricorn and the distance measure for a degree of latitude changes from 75 Miliaria, (meant of course to be 75 Roman miles and hence 90 Miliaria,) to 60 miliaria and thus it was probably surveyed in millas geometricus and the usual mis-understanding arose with the nomenclature exchanging one mile for another and thus the Southern tip of Africa at c35S is in fact drawn 11 ½ x 30 miliaria short for complete accuracy, but of course it is in fact to the latitude used only 11 ½ x 15 miliaria short, the distance being from the Tropic to c35S. That is approximately 2.3 degrees in the latter measure. But quite definitely the Portuguese League is 20 to the degree of latitude on this chart. Unfortunately there is a complete mismatch of Leagues or Legoa in the record as Portugal has at least three on record giving either 17 ½, 18 or 20 per degree. The Caverio Planisphere has been variously described as a copy of the Cantino Planisphere which was seen in Genoa on its arrival c05/11/1502AD before it was sent to the Duke of Ferrara, or, just having a similar origin to the Cantino Planisphere but from a copy. Dealing with the possible viewing first, I have opined that Alberto Cantino probably arrived in Genoa 5/11/1502; resided there for a week after his month long journey from Lisbon; handed over the Copy Planisphere to Francesco Cattaneo to deliver to the Agent of the Duke of Ferrara and departed 12/11/1502 for Rome to arrive in time to be able to write a letter to the Duke of Ferrara dated 19/11/1502. Hence in all probability the letter and Planisphere were in the hands of the Duke approximately 26 to 30/11/1502. Hence it is highly improbable any person had enough time to study (even if it were to be allowed) the planisphere and gain enough detail to draw a new copy, let alone save the information for some three years and draw another copy in 1505AD. I find that theory untenable as the work is prodigious. Undoubtedly, “Nicolay de Caverio, Iannenis” had access to a copy of the Portuguese original, that is assuming he did not travel to the abode of the Duke of Ferrara in c1504 and was given sight and use of the original copy, but that is pure speculation and as will be shown it is likely a third hand copy at least of the original planisphere. The whole Caverio Chart is Portuguese and does not indicate discoveries made after 1504, thus the date is acceptable. The first point I will question is, although Caverio is Genoese he does not state he drew the planisphere there, merely his own origins. Secondly, I do not believe the Cantino Planisphere was the only copy as the preceding text clearly indicates as I believe the Cantino Planisphere is a “cobbled together” chart using two different drafts of the chart. 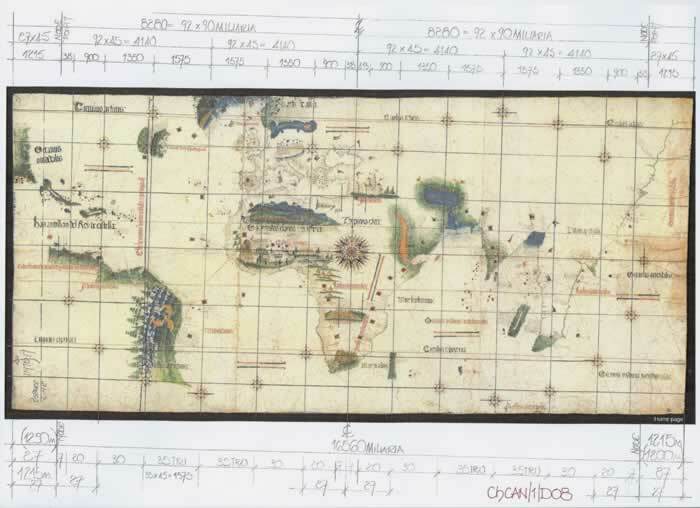 Thirdly, the original was drawn in 1501 and by 1503/1504 was already well out of date regarding the knowledge of the Far East from Portuguese explorations and thus it is highly likely that the original atelier copies were probably available and thus used by Caverio for his planisphere. The original is held by the BnF, Paris and is available on the Gallica website. It is 1150 x 2250mm and hence slightly larger than the Cantino which is 1050 x 2180mm. The differences between the two are in fact marginal in their geographical content, but vary considerably in their construction and their accuracy. In the west the chart indicates an extension of the North American coastline southwards with the probability that it indicates Florida and the Gulf of Mexico trending south towards the Yucatan Peninsula. Certainly the coast of South America has more toponyms appended, probably the result of two expeditions, 1501/1502 and 1503/1504 where the Portuguese reconnoitred the Brazilian coast probably as far south as the Tropic of Capricorn. When we study the African continent, particularly south of the Equator on the east and west coasts there are a plethora of Portuguese toponyms and 10 “Padroes”, the carved pillars marking Portuguese claims. 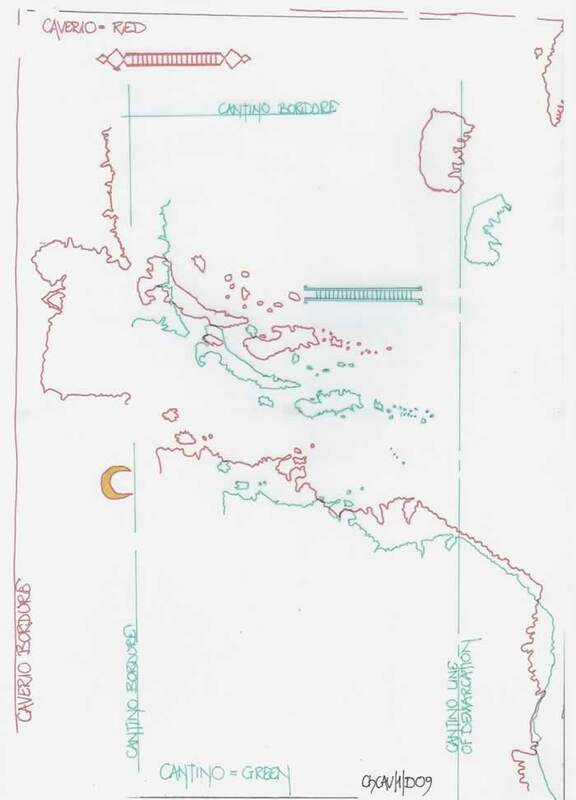 The Red Sea has been corrected in that the northern section approaches the geographical position, although it is drawn in an east/west format when it is basically north/south, which was more correct on the Cantino Planisphere although on that chart it is placed wildly out of position longitudinally. India is basically the same on both charts with the Malay Peninsula vastly out of scale and Sumatra/Taprobane equally mis-positioned. Unfortunately the Indus Delta and the Ganges Delta are drawn out of position, where-as on the Cantino Chart they were acceptable. 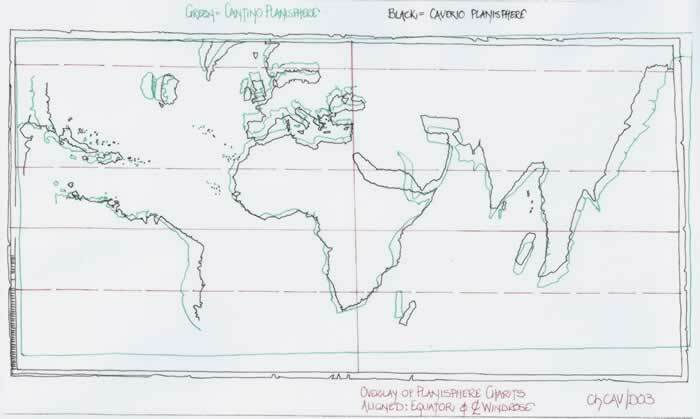 Before proceeding further with an analysis of the Caverio Planisphere, the comparison to the Cantino Planisphere must be addressed and determined once and for all. The first diagram is merely the Cantino Planisphere with the Equatorial and Wind Rose centre line appended to an overlay and is merely included to ensure a proper recognition of the comparative plot which follows. 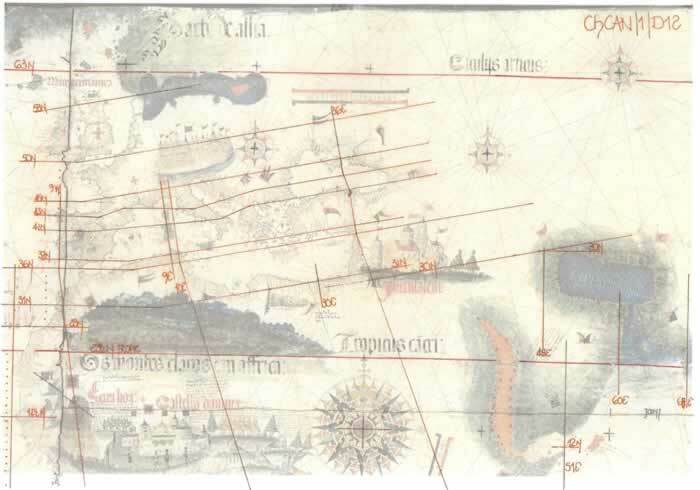 The second diagram is an overlay of the Cantino Planisphere upon the Caverio Planisphere aligned to the Equator and Wind Rose centre lines on each chart. From this diagram it is quite obvious they could share a similar origin, but it appears to be an origin at least twice removed in that each time a copy is made and then it is itself copied the errors multiply and magnify. A direct copy of the original or Cantino copy would have had a greater degree of conformity for the geographical features, although size and wind rose setting out need not be the same. But if you are copying, why bother to change such a fundamental point! And, if you are actually copying a chart the wind rose lines are an asset to be used. But please bear in mind that this plot of the two planispheres are in fact 1/25th size of the original; that is 1/5th of the height and 1/5th of the length and hence if the two charts were compared full size with the same alignments, the differences in the profiles will expand to five times what is now apparent and I suggest that no doubt a totally different perspective of the similarity of the two charts would be obtained by the viewer, as I will indicate later. But, and it is a very large BUT, what you have just read and studied on the diagram is a “Trompe L’0eil”, and it has fooled previous researchers into thinking the two charts are compatible. They are not as will be clearly shown in the Post-script to this text, but interested parties may care to examine the scale bars on the two charts. Therefore before I explain the problems encountered it is necessary to confirm the scale bar measurement and thus the charts internal distances for all to see. As the Windrose is normally the first item to be drawn, it will therefore normally control the overall size of the chart. Contrary to the Cantino chart there is only one central Windrose, but the putative “radius” is 4800 miliaria and has been repeated to each side of the central 9600 miliaria design. This clearly indicates a slight mis-measurement for the overall form of the chart in that the western residual length is 1150 miliaria where-as the eastern side has an extra 750 miliaria only. The latitudinal setting out is equally slightly awry being 550 and 350 miliaria but it was no doubt intended to be 450 miliaria north and south. Thus the internal length to the bordure is 21100 miliaria width and 10500 miliaria in height. It therefore has a design probability of a 2:1 ratio which was just missed. I have indicated what may be considered an error in the western section of the Windrose construct which does not accord with the eastern section and thus reduces the symmetry of the overall Windrose layout which should be derived from the 4800 miliaria base measurement. Obviously the 2 x 4800 miliaria Windrose putative diameter required to be measured. This of course could have been from the Scale Bar sized to allow full measurement, or, it could have been firstly chosen as a “known” measure and the miliaria scale bar adjusted to suit. If we proportionately adjust the 2 x 4800 overall measurements it is approximately 3 feet of c336mm. This equates possibly to the Piede Manuale of Genoa, but it also could apply to the Portuguese measurements discussed under the Cantino section. When the Equator is positioned it is set out quite deliberately as 6000/4500 on the overall 10500 miliaria height, or latitudinal measurements. If a standard 90 miliaria degree is adopted that would give a split of 66.66/50 degrees, but the latitudinal scale (if that is what it is) drawn along the western edge of the chart does not agree. Having carefully set out the divisions, as will be seen on the larger plot to follow, I found there to be a 74/54 degree split, which gave a variable measurement per degree north and south of 81.08 or 83.33 miliaria. However, if the calculation is made for the overall height of 10500 miliaria then the 128 degrees are each 82.03 miliaria. If a degree is 20 leagues of 4 ½ or 3 units and it is reduced to 18 by number then, 20 = 90 miliaria and 18 = 81 miliaria. Could this be the reasoning behind the western scale bars measurements? It would only take a revision of the 54 degrees to 4500 miliaria to in fact be 55 degrees for the whole scale bar to read c81 miliaria per degree. It is one answer, but the actuality may never be known. However, study the text MsFER/1, the position of the Line of Demarcation as construed by Jaime Ferrer and read just how far fetched changing measurements can become! ola and the Antilles are grossly exaggerated. South America is positioned abnormally close to West Africa and then its longitudinal measurements are overstated where-as the Cantino chart is reasonably accurate. The Mediterranean Sea basin plot is acceptable, but obviously not drawn very accurately when it is portrayed quite accurately on most Portolan Charts. 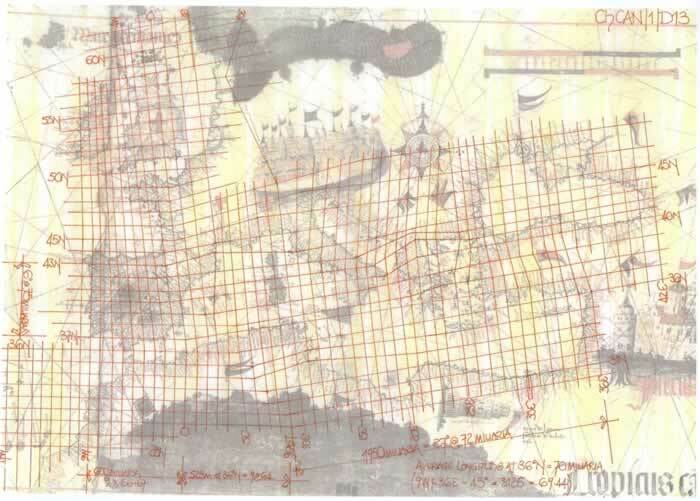 Thus I suspect this Caverio chart is a copy of a copy, not drawn by an expert in the overall measurements of these lands and this has lead to a series of mishaps in the draughtsmanship. Africa suffers from the same inaccuracy which is marring the presentation as the toponyms copied from a Portuguese original are excellent as are the “padroes”. It is obviously shortened in some sections, probably mis-copied and thus I opine that Caverio was not an expert cartographer, merely a jobbing draughtsman. Unfortunately I think the east coast of India and the Bay of Bengal have been drawn mistakenly by Caverio as the western coast at the Gulf of Cambay has been drawn to the north, shortening the entrance to the Sinus Persicus and thus creating the imbalance across the Indus/Ganges latitudes. However the description of this area could just be copied from the Cantino text as there is nothing new to explain. 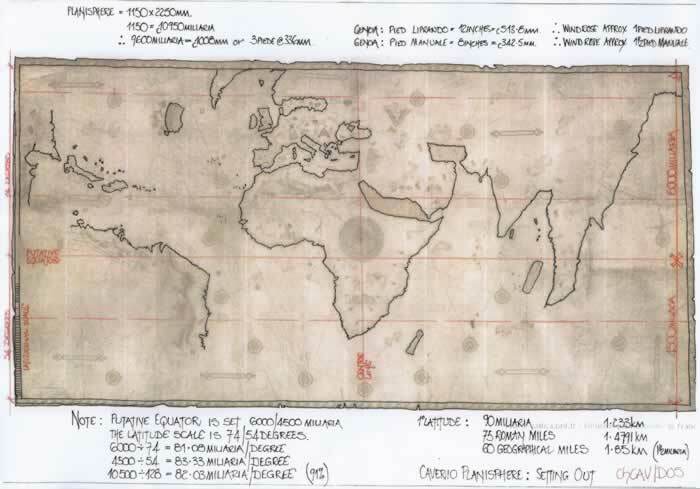 The Caverio Planisphere is an attempt by a person lacking in major cartographical knowledge of form or distance measure to reproduce a chart similar to the Cantino Planisphere, but I doubt Caverio would have known that was the end result. 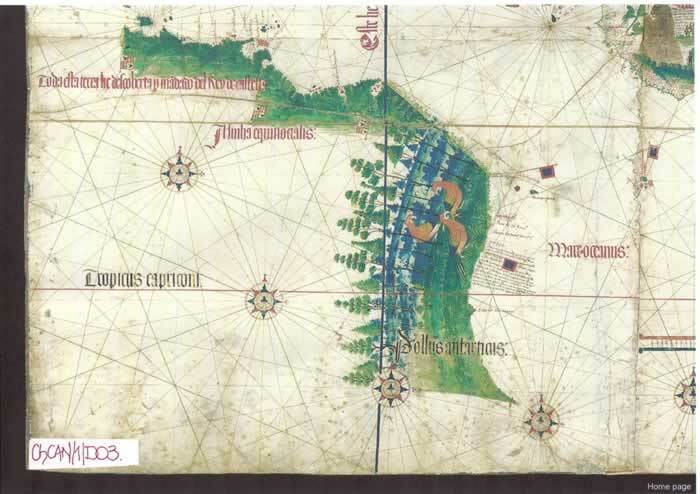 It is only possible to make that statement because Caverio appears to have copied a copy or two of the original Portuguese Planisphere which by 1503/1504 was already out of date and thus probably no longer under the embargo by the King of Portugal. Exploration was now occurring at such a pace in both the Far East and West Indies as to virtually make charts outdated before or as they were completed given the timescale for such large undertakings. But, did Caverio copy the copies in Genoa or in Portugal where they would have been readily available. It is after all a totally Portuguese product which by the time of its drawing was out of date and it is highly unlikely an outdated totally Portuguese chart would have had a large market in Italy at this time. After all the Cantino was purloined for a reason which by now was defunct. I am not convinced of an Italian provenance and certainly not one that suggests Caverio saw the Cantino chart in 1502AD. There are six diagrams to explain the “Trompe L’oeil” that occurs when researchers just view the two charts side by side at small scale not even at a larger size, or better still full scale. Unfortunately a chart or charts 2250mm long are quite cumbersome and I have chosen to use copies at 0.432 as it fits my parallel motion drawing board and are thus capable of being fully assessed. The planispheres at the same scale have been aligned firstly on the centre lines of the chart wind roses and illustrate the complete lack of coherence in the profiles as the small scale illustration diagram ChCAV/1/D03 clearly indicated. 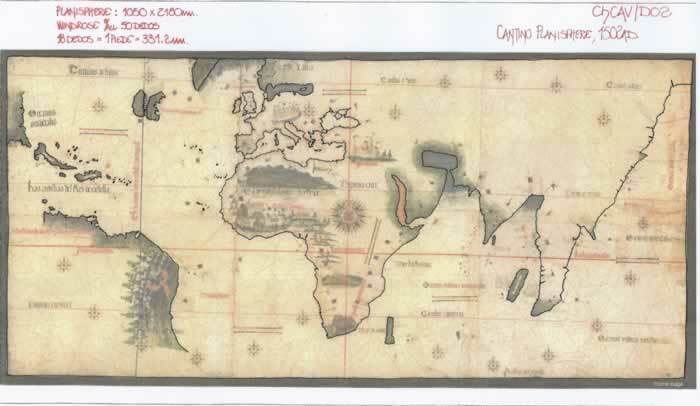 Diagram ChCAV/1/D09 has the West Indies and the north coast of South America there-on and it illustrates a different setting out of the coasts and islands, but that is discussed again later. Diagram ChCAV/1/D10 illustrates Africa and Europe and the complete over size of both when the scale bars are equated as is clearly shown on the plot. 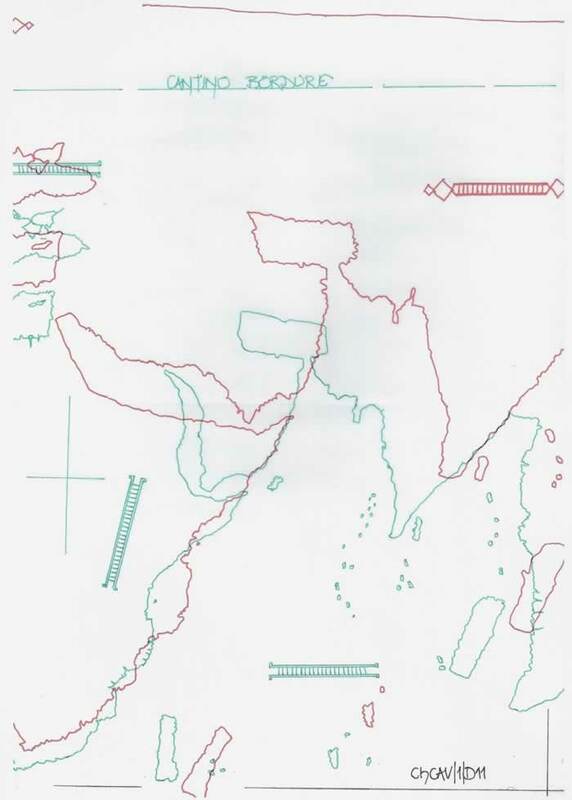 Diagram ChCAV/1/D11 illustrates the Indian Ocean section which clearly continues the expansion of the plot seen on the previous section. Diagram ChCAV/1/D12 is the Malay Peninsula which appears to begin to conform dimensionally one to the other. 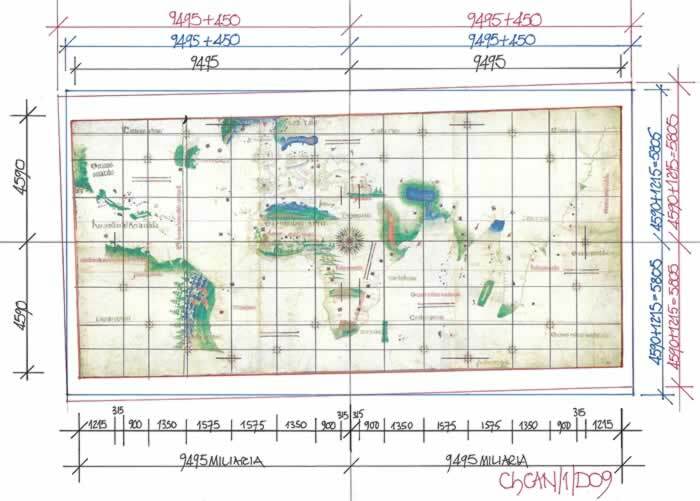 The outlines of each chart are appended to each section and it can be seen that the overall dimensions of each chart, Cantino; 1050 x 2200mm and Caverio; 1150 x 2250 are in fact altered in that the Caverio Planisphere grows in size when the scale bars are equalized. The first diagram, ChCAV/1/D13 has two distinct sections there-on, marked A and Z. The first section, “A” has the two plots aligned on the north coast of South America as that has been shown on previous examinations to be the most accurately positioned latitudinally. Thus the difference in the plots reduces considerably and it can be seen there is in fact a similarity that does not at first appear to be a fact. Thus in section “Z” I have merely moved the Caverio plot of Cuba and Hispaniola southwards to align and illustrate the good similarity in the sizes and plot of these islands. Obviously in the north Newfoundland and Greenland would become closer in contiguity but then the north coast of South America would become separated on the plot. The second Diagram ChCAV/1/D14 has the Malay Peninsula aligned at Singapore and thus indicates a very similar plot, but of course in actuality it is wildly out of place on the overall chart comparison. I am continuing the comparison of the Cantino/Caverio planispheres in the next text ChFANO/1, and thus have not included a reconciliation of the central areas, that is Africa and Europe as it now appears to me the Caverio Chart may be a “pastiche”, sampling sections of charts and not directly copied from a single chart. If Caverio had copied even a copy of a copy of a copy of the Cantino planisphere, yes the errors would multiply but they are just too great for even an indirect copy to be assumed. I have commented that I consider the Caverio chart to be poorly constructed in terms of the distance measures as can be clearly seen on the various diagrams and the cause of this large set of errors could just be sections copied from many charts and joined with little regard to the equalization of scale bars, even if that fact could have been recognised as a problem by Caverio. 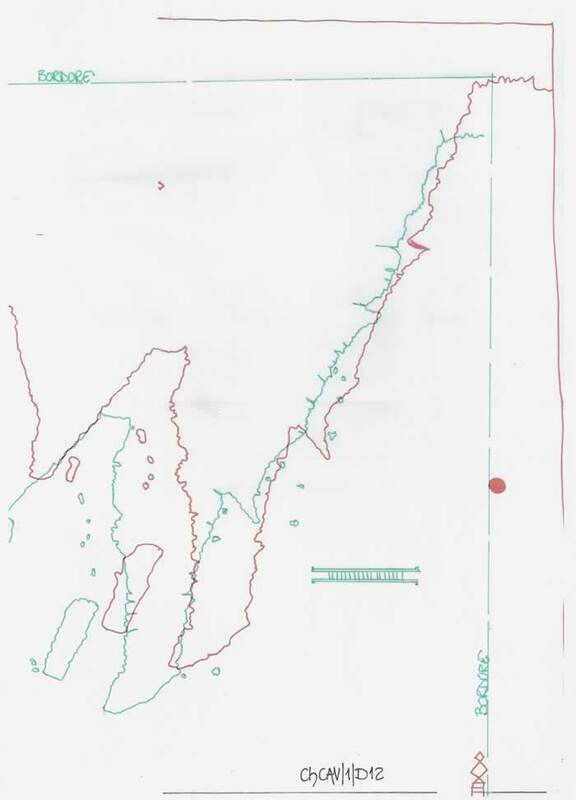 The last diagram in this section is of the eastern seabord of South America and has highlighted upon it the structure to be seen in the South Atlantic just off the coast. First discussion; when Goncalo Coelho first sailed to South America it was south along the coast to Rio de Janeiro with Amerigo Vespucci aboard. That was in 1501/1502. The second voyage sailed from Lisbon 10/5/1503 and by November was at the Baia de Todos os Santos. They sailed further south and built a fort and loaded lumber and leaving 24 men at the fort sailed for Lisbon arriving 28/6/1504. Second discussion; but as with all speculation there is another possibility that the structure is in fact “The Abbey of All Saints”, “Abaia de Todos os Santos”, or “Abaida de tuty li santy” which became the “Bay of All Saints”, “and was so named by Cabral on his 1500 voyage. To my eyes the finial on the structure is definitely a Cross. But on the FANO Chart we read “Tera de Consalio Coigo vocatur Santa Croxe”, “Land of Goncalves Coelho also called Santa Cruz”, and then “Abaida de Todos Santos”, “Bay of All Saints” on both the Cantino and FANO charts. Confusion reigns, but one answer is probably correct. Thus the diagram in question is probably another “Pastiche” which incorporates the Fort, the Abbey and the “True Cross” surmounting it all. Speculation meets medieval mysticism!